The Vollrath 52026 16 1/2" high-temperature spatula is the perfect utensil for all of your baking needs. The 16 1/2" spatula is heat resistant up to 500 degrees Fahrenheit. This spatula is awesome. It equals or surpasses the Rubbermaid version and at a much lower price. It is the perfect length for larger stock pots and to avoid splatters when cooking with high-heat. We love these spatulas! I believe we own about 30 of them. They are an awesome length and makes scraping product out of deep mixing bowls so much easier. The handle is very nice. Great quality! These are a very good product. I often use the to clean out the deep bowl. They work efficiently without having to reach into the bowl and get your hands messy. I would buy again if needed. Even at 16.5 inches, these spatulas have no flex in the handle. This is handy when mixing something with resistance. Like items usually flex, and that is a sign of potential / inevitable failure in the not to far away future. Not these. Highly recommend these spatulas. this is a very well made, heavy duty spatula. it is long enough to scrape the bottom of a 15-20 quart mixer and really does hold up to high temperatures very well. For a lightweight, low cost, and extra low spatula, this thing is great. We end up finding a million uses. and can get to the bottom of our deepest posts. It holds up really well to heat and constant use. We tend to pay more money for quality items. If you are a professional cook or baker. Your kitchen can not perform to it's highest potential without this spatula. It will save you tons of money on batter and sauces that the other spatulas couldn't get out of the bowl. Though this is a more expensive item, this is our new staple. Tried the generic versions, but none of them were stiff enough or lasted long enough. Very resistant spatula to work with all kinds of mixes, scrapes nicely around the bowls. Work well with frostings and cake mixes, as well as cookue dough. Holds up well in high temps, just as advertised! Spatula is used and abused daily by us, repeatedly and holds up great! High quality. Great price and immediate shipment. We ordered these for our kitchen after the previous ones we ordered broke repeatedly whenever we used them on our mixer. These new ones lasted an entire summer of tough use in our kitchen. They also were a lot more flexible, and held up to the heat a lot better. We love this spatula. While it works well for our standard mixing of frosting and scraping of mixing bowls, we also use it when we make hot puddings, caramel, and pie fillings as well. It hasn't stained, and has held up well over lots of use & washing. Really great product, doesn't melt with hi temps, this length is great for working in stock pots. When I've used them in the past they typically last at least a year even with high volume use. holds up against the hottest of flat tops and pans. has a great handle on there to flip the eggs or move the items around inside the pan. The Vollrath spatulas are a staple in our kitchens. We have a variety of products in production at any given time and the long handle on this spatula assures that we won't get burned! Although I do not use this size as much as I use the 10" & 13" I couldn't pass up getting this for my kitchen. The price just can't be beat. I really like these spatulas. Since the handle is thick, they are easy to hold, but also when set down on a table the blade portion is raised and does not touch. The perfect large size spatula. Vollrath has great stuff. i use these everyday. The high temp is the best thing to have in the restaurant A must have for anyone. Love the sturdiness of Vollrath high temperature stlicone spatulas! You get what you pay for in this case, these hold up to lots of use, and I like the LONG handle to get to the bottom of my big mixing bowls. At our company, we use this spatula when making liquid diet for our adult Lepidopteran species. 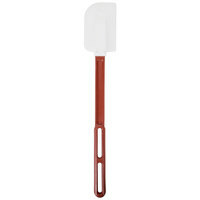 We like using this spatula but it is stiff, it just needs to be a little bit more flexible. Just the right size - both the spatula head and the length of the handle. High temp is the best, and so versatile. Just grab the tool and don't need to know if it's the right one, because it works for both hot and cold without worry of melting. We heat chocolate chips to make our chocolate frosting, and this high temperature spatula is great for handling large amounts of warm ingredients in large mixing bowls. The 16 1/2 inch long spatula was very useful in so many ways in our recent church event. With large bowls and pots this spatula was perfect for reaching to tge bottom and allowing for great manageability. I love this spatula! It is very sturdy and works great for folding and scraping bowls clean! Wish there were more color options. Other than that awesome tool! we really like this spatula, we are using it to stir sugar while we are melting it down to make caramel, that is about the hottest usage I can think of and it did not bordered the spatula. Extremely durable product. After using one for years you dont realize what an essential piece of equipment it is. A necessity to every kitchen for day to day use. Scrape the last 30 cents from a #10 can using this spatula. Great high temperature silicone spatula, has held up very well over the years. One of my chefs tried to convince me to stick it in the deep fryer to test how far it will go. I decided against that, however I am curious. This spatula really works great. Other spatulas have ripped or torn. This one seems to hold up to anything it comes into contact with. It does really well with heat also. These spatulas are the only ones that can hold up to stirring huge amounts of thick product without bending and breaking. A flimsy spatula is worthless when it's this big, but these ones really hold up. The spatula head really is heat resistant, however it will stain if you are stirring something that is heavily tomato based. Easy to clean, easy to use, cheap and worth every penny. One downside though is they aren't the most comfortable handle to hold onto if you really have to grip it hard and stir something really thick. It could be more comfortable, but that is a small inconvenience to have a sturdy handle. Not much to say about a siocone spatula. This is a strong effective spatular. Good for stirring ingredients and using up the final drop in the bow. The absolute best High Temp Spat on the market. Lives up with its title of being a high temp spat and the 16 1/2" is the perfect size to get into 16 quart sauce pans. One of the best brands for this type of spatula. We use these on a regular basis and always around high heat. These seem to hold up and not melt easily. We make homemade fudge and this is perfect for stirring melting butter as it is resistant to high temperatures. Would recommend for any establishment that prepares homemade goods. Best damn high temp spatula on the market, I only buy this brand. I go with the long handle one so I can use it for both cooking and scraping bowls. Very durable for commercial kitchen. We've purchased several of these spatulas and these are the only ones that don't break! The handle is long enough so you're not covered in batter or frosting and they withstand high heat! We bought a dozen or so of these to assist all of our prep for dinner service, they are extremely durable and function great yahoo baby! I love the larger high temp spatulas. They are great for the seven and twelve quart mixing bowls. They scrap well and really get the job done. We only use high temp spatulas. Sturdy handle and nice temp resistance. We use it to stir boiling pastas and also when frying garlic or onions in the frying pan. Never had one melt. I needed a high quality spatula for hot items as well as one durable enough for all my cookie doughs. This spatula has worked out great for both. It washes up great with no staining and has not peeled like my other "high temp" spatulas. These are the perfect spatula. Great weight, they feel balanced in the hand, neither the handle nor scraper melt under high heat, maintenance free, years of use ahead of them, and they're cheap! Buy one of each size and replace the spatulas you have. I LOVE these spatulas. I cook in very high temperatures, and these can withstand the heat. I love the fact that these are one piece, too!